I’d love to help your conference or event attendees learn more about customer development, product management, user experience, and enterprise change. I give highly-rated and highly pragmatic talks – my goal is for every attendee to leave with useful ideas and pragmatic techniques they can immediately apply. I’m based in San Francisco, but am happy to travel for speaking opportunities that are a great mutual fit. 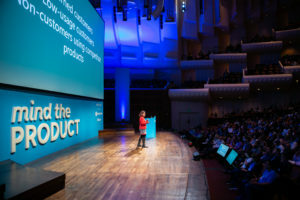 I’ve recently spoken at Mind the Product in San Francisco, Microsoft Build in Seattle, and Øredev in Malmo, Sweden. Local SF Bay Area organizations supporting Black and Latinx people and/or women in technology, please reach out – I will speak pro bono or help you find another great engaging speaker. Potentially interested in having me speak at your event? Please complete the form below, and I’ll get in touch with you. I consent to having my submitted information collected and stored in order to respond to my inquiry.